Another week closer to Spring and flying weather. This time of year also invokes a frenzy of model building as the day when the sun will finally shine and the wind chill factor will become tolerable approaches. The balance between sitting on top of the fire to keep warm and carving that intricate balsa cowl finally stabilises and one can sand and plain a block of wing ribs without wearing gloves. Glow batteries and Rx packs finally show some signs of life and glow fuel stops drinking water at an alarming rate. Ah - life is good! I've even gone so far as to predict the probable dates for maiden flights of the various projects that have occupied me during the winter months and I can finally get back at those bragging northern hemisphere modellers who have haunted my dreams with tails of ideal weather and long extended flying sessions in a cloudless sky. I recently took the time to study the statistics of my blog and I was pleased to find that I have readers from all over the world. It proves my belief that aero modeling is a universal hobby in all countries and all cultures. To my readers in Belgium, Brazil, Canada, France, Germany, India, Italy, New Zealand, Romania, Russia, Serbia, Spain, South Korea, Thailand, The UK, The United States, Afghanistan (Coalition Forces I suspect - I'm honored Fella's - keep up the good work) and of course, my own Country - Australia. I say thank you for your interest in my humble modeling efforts. I'd be pleased to hear from any of my readers and, if any are so inclined, send me a photo of your models, I'll start a special Reader's Gallery to display them on this blog. I can be contacted directly - my email address is echo.echo100@gmail.com. A MODEL FOR A FRIEND. I have a mate, an 85 year old gentleman who is new to the hobby and struggling to come to grips with the technicalities of building as well as flying and, due to some early miss guided advice, has amassed a collection of unsuitable "Foamy" models, most unfortunately are now at least partly or wholly destroyed. The unfortunate fact is that a lot of these models, which now flood the market, are unsuitable to learn to fly on. I am sure that a lot of would be modellers never get to meet anyone who has experience in the hobby - and they fly without the guidance of a club in miscellaneous parks and fields. The sad fact is that these modellers soon become discouraged and are lost to the hobby for ever. 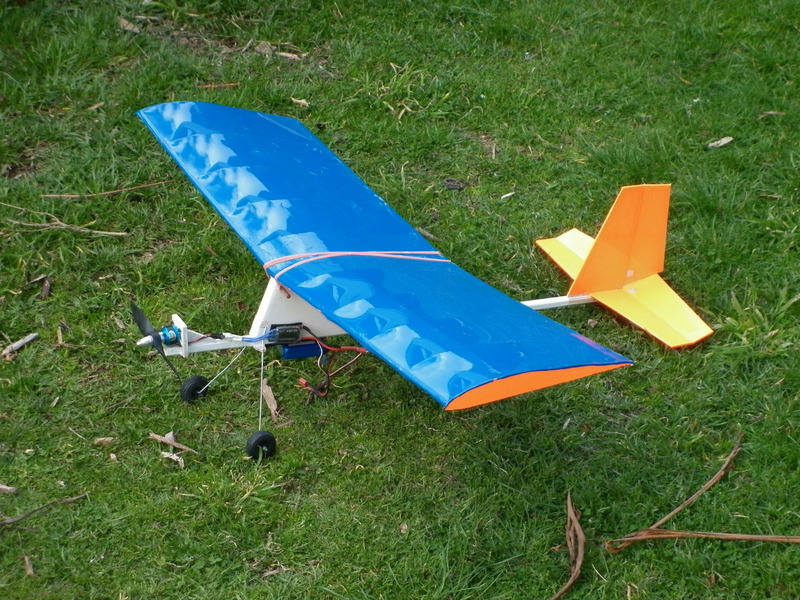 My mate was almost to this point when he came across our club and I decided to build him something slow, stable, easy to fly and at minimum cost. I rummaged through my plan collection and came across an RCM&E free plan that was in one of their monthly issues. I had a fuss around in my off cuts box and soon found enough balsa, covering and ply to cobble it together. My friend supplied his own outrunner motor, 20 amp ESC, Receiver and Lipo battery. The result is an ideal Trainer at minimum cost - plenty of wing area, low aspect ratio, and with 3 channel control. I'm going to present it to him this coming week and hopefully he will gain a lot of pleasure and flying experience with the model. Now, an update of progress on my own builds: - It might be said that a corollary to Murphy's Law is - What can go slowly will go very slowly! The ongoing wait for supplies of all kinds is ever present. The Lanzo Bomber: Work has stalled, with much cursing and muttering around the wing pylon and fitting in the servos, fuel tank and battery. The model has a very short nose moment and so I'm trying to jam everything as far to the front as possible - the alternative is a prohibitively large lump of lead to get the CG right. One of the traps with building RC assisted Free Flight Old Timers is that a lot of them have very short nose moments - the CG in FF models tends to be a bit further back than is comfortable for RC stability. It works like this - if I find room for the battery as far forward as possible then the servos can fit in immediately behind BUT then the big question is where to put the bloody fuel tank - I can hardly ask it to run along side! One of the problems with this juggling act is the diamond shape of the fuselage, Usually one can pack bits on top of each other but with the configuration of the diamond shape all that room that is available in a rectangular cross section is somehow wasted. I'm trying to get my head around mounting things at what to me is a weird angle. I will persevere. The Telemaster: The wing is finally done and I'm wrestling with bend radius's to form up the aluminium undercarriage. Pretty soon I'll have a photo or two of the finished article and then onto the maiden flight which is scheduled for two weeks from tomorrow - weather permitting. The BIG Lazy Bee: As mentioned previously I hate making bloody laminated wing tips and stuff so that part of the construction is still dragging it's heals however the fuselage is almost ready to cover and fit out and the wing, which is enormous, has all but it's wing tips (yep, they are laminated). Please don't ask about the fin, rudder and elevators - you'd hate to see a grown man cry. The Aero Commander: I have plotted, measured, adjusted, sworn a lot and threatened to feed the damn thing to the pigs but I'm still battling with the accurate formation of some of the fuselage formers. Trying to get an accurate pattern for a former which has to go three quarters of the way up a 6 foot long fibreglass fuselage without easy access is not the stuff of gentle model building. One of the problems is the lack of uniform thickness of the fibre glass fuselage so it's a matter of make a pattern then cut, then endless adjustments to get it just right. I could say near enough is good enough but that little gremlin that sits on my shoulder keeps making me go back to get it EXACTLY right. Minimal/no advancement: I'm not making much progress on the Lancaster, the Fournier or the Hustler Delta at this stage - various reasons - supply of parts and materials, lack of motivation, to many damn projects going at the one time, nutting out the solution to a problem, Murphy's first Law - all of the above. I've been using a few of those cheap - semi disposable digital cameras to take my photo's and I finally got sick of the damn things going bust so I decided to go get myself one of the latest you beaut all singing, all dancing digital SLR's. Top brand, highly regarded. Yeah right - I've had the bloody thing for three weeks and it's broken down 4 times!!! It's currently back at the supplier AGAIN so I'm sorry gentle readers - I'm still dragging the chain getting photos ready for the blog but if the Dealer gets of their backsides and gets things fixed I'll update things mid week.